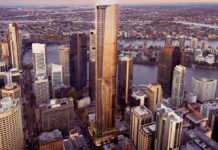 Pellicano and Perri Projects’ $600 million lifestyle precinct, South City Square in Woolloongabba, has won the ‘Residential High-Rise Architecture’ category in Australia for one of its six residential buildings, New Deshon, in the 2018 Asia Pacific Property Awards. 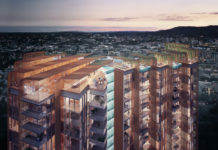 Judged by an independent global panel of 80 industry experts, the Asia Pacific Property Awards, currently in its 25th year, are internationally renowned, reinforcing Pellicano and Perri Projects’ clout among the property elite. Conceptualised by DBI Design, New Deshon was launched to the market in 2015 and sold out to local owner occupiers and investors. Now standing complete, the building design has industrial influences in a nod to Woolloongabba’s unique heritage. 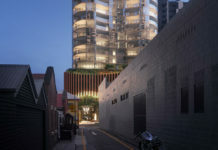 In its overarching design and materiality, New Deshon has been designed to naturally relate to its neighbouring towers, One South City and The Mews.  Development operations manager at Pellicano, Michael Kent, said the award was a testament to the strength of Pellicano and Perri Projects’ vision and commitment to the area. “We are thrilled that New Deshon has attracted this prestigious award, it is a true mark of excellence in the industry, a sign of distinction among our peers and assurance to our purchasers,” Kent said. “South City Square was first conceived as a community within a project, designed with all the everyday amenity and facilities residents would need, like shopping precincts, restaurants, specialty shops and large public spaces, all within the one vertical community. “The award recognises our holistic approach to property development where careful consideration of design, functionality and lifestyle forms the crux of our projects. “It acknowledges our passion behind this project while cementing South City Square as a progressive mixed-use development and a worthy competitor on the world stage,” he said. Offering one, two, and three-bedroom options, New Deshon apartments feature terraces that deliver views oriented to the north across the bay. Internally, natural oak timbers, Calcutta stone countertops, metallic black elements and integrated European appliances are showcased. New Deshon offers residents a professional concierge service, stated to be equivalent to a five-star hotel. A rooftop pool, terrace, infrared sauna, barbeque and outdoor dining areas have been constructed on top of the tower. 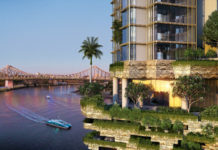 Set to transform the south of Brisbane, South City Square’s premium amenity includes a Woolworths supermarket, a 500-seat Reading Cinema complex, a six-star hotel, wellness centres, childcare facilities, specialty traders, landscaped gardens, extensive ground floor retail and dining, all centred around a 5,000sqm public open square. In 2017, South City Square received the award for best overall mixed-use development from the Asian Pacific International Property Awards.